When natural gas is extracted from the ground, the chief component is “methane,” or what we typically think of as natural gas used to heat homes. 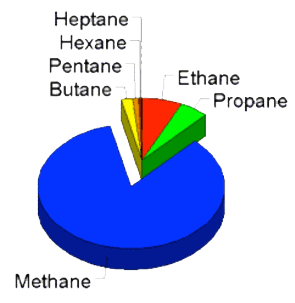 Many wells produce “wet gas” which includes other gases like ethane, propane and butane, and liquids such as pentane, hexane and heptane. Under high pressure, the NGLs are in a liquid state while at normal atmospheric pressure are about 85% gases. Together, these make up what is called “natural gas liquids,” a fracking byproduct not to be confused with liquefied natural gas. Once the methane is removed, the remaining product needs to be “fractionated” or processed to separate out the individual components that are used as fuel or as feedstock for petrochemical plants for making products such as plastics. This pipeline would transport the mixed NGLs to Louisiana and Texas where there are fractionating plants for separating the various products. In August 2013, Kinder Morgan Energy Partners and MarkWest, two large energy/pipeline companies, announced a joint venture that would re-purpose the Tennessee Gas Pipeline from its current use for natural gas to carry natural gas liquids (NGLs). The line would carry raw NGLs from Ohio to the Gulf Coast for processing and export. Kinder Morgan has since taken over the project. The Tennessee Gas Pipeline cuts a swath from Ohio into northeast Kentucky along a route close to Morehead, Richmond, Danville, Campbellsville and Glasgow before entering Tennessee on its way to Louisiana. 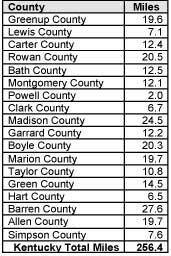 Eighteen Kentucky counties would be affected. When fully operational it could carry 400,000 barrels per day. Why is this a concern to people living along the route? The NGLs would be transported under high-pressure and therefore in a liquid state in a pipeline built to transport natural gas. Pressure fluctuations are much more severe in a pipe transporting liquids instead of gases. When NGLs leak, about 85% will turn into an odorless, colorless and highly flammable vapor once they hit the air. NGL vapor is heavier than air and will stay low to the ground, settling in valleys, creeks, rivers or other low points. These vapors can be ignited by heat, spark or flame. That means a tractor or car engine can set off an explosion. An NGL explosion in Floyd County, Kentucky in 2004 incinerated five houses and sent nine people to the hospital. That was from a 4-inch diameter line. 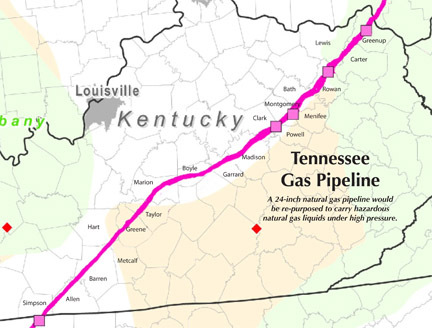 The Tennessee Gas Pipeline is 24 inches in diameter! Further, NGL vapor is an asphyxiant (meaning it replaces the oxygen in the air) and can cause dizziness, unconsciousness or even death by suffocation. The other 15% of an NGL leak remains a liquid and may contaminate the soil and water with chemicals like benzene, a known human carcinogen. Due to the many sinkholes, springs and caves in Kentucky, NGL leaks could rapidly contaminate water supplies used by people and agriculture. An NGL leak (again, from just a 4-inch diameter line) in Parachute, Colorado in 2012 led to the removal of thousands of cubic yards of contaminated soil and months of cleanup. Doesn’t the company monitor for leaks? Like similar pipeline companies, Kinder Morgan pledges “continuous 24/7 monitoring of the pipeline” for leak detection. However, a Wall Street Journal analysis found that fewer than 20% of leaks are detected by pipeline control centers set up for that purpose. This causes concern because the best pipeline monitoring equipment can detect a leak only when there is a 1.8% or greater drop in pressure. At 400,000 barrels per day, this means more than 300,000 gallons could leak every day without being detected! Is this pipeline suitable to carry NGLs? All the proposed re-purposed pipe for Tennessee Gas Pipeline was manufactured prior to 1970. Pre-1970 pipe for natural gas was longitudinally welded with welding technology that is no longer considered acceptable and is known to fail along the weld seam. Also, pre-1970 natural gas pipe used obsolete exterior protective coatings that are known to disbond, and therefore reduce protection against corrosion. But the company will be careful, right? Kinder Morgan, which will operate the pipeline, has a rather poor safety record, not only for pipeline accidents but also for workplace safety violations cited by the U.S. Occupational Safety and Health Administration. In 2011, the U.S. Department of Labor sued Kinder Morgan for underpaying workers. From 2006 to 2014, there were 92 documented “significant incidents” along the Tennessee Gas Pipeline, resulting in $88,144,152 in property damage and 19 federal enforcement actions – showing that the decades-old line is not in good shape. Faulty infrastructure (corrosion, equipment malfunctions, manufacturing defects, faulty welds and incorrect installation) causes the majority of these accidents. Kinder Morgan must apply to the Federal Energy Regulatory Commission (FERC) for permission to “abandon” natural gas service in the existing line. FERC will consider this request based on whether natural gas service for any existing customers would be affected, or the overall natural gas supply altered. However, once FERC approves the abandonment it has no further jurisdiction over how the pipeline is then used. Also, if the abandonment is approved, pipeline ownership would be transferred to Utica Marcellus Texas Pipeline, a limited liability partnership between Kinder Morgan and MarkWest. √ If you are a resident of a targeted county, talk to your county judge-executive and local magistrate about your concerns. Local officials are hearing from pipeline representatives, and they need to hear from local residents as well. Ask what they will do to protect the health and safety of you and your neighbors, and make sure that emergency crews are prepared and equipped for NGL disasters. √ Talk to your neighbors to let them know what’s going on and how you might work together to educate the entire community and get action from your fiscal court or county planning and zoning board.